There is nothing more aggravating than injuring yourself halfway through a run, especially when you are on the hilly terrain of your favorite scenic trail. Unfortunately, injuries are more common during these trail runs due to the uneven terrain and hazardous objects on the ground. If you are experiencing pain on the lateral side of your foot after one of these trail runs than we want to educate you on a commonly overlooked injury that may be causing the pain. This condition is called Cuboid Subluxation. Before we begin talking about the condition, it is important to understand a couple facts about the anatomy of the cuboid within the foot. 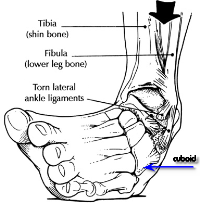 The cuboid is a small bone of the midfoot and lies on the lateral edge of the foot. Just like other bones of the foot, the cuboid has bony landmarks, such as the large groove on the bottom, which acts as a fulcrum for the tendon of the peroneus longus muscle. The peroneus longs muscle tendon runs passes through the groove on the bottom of the cuboid in order to reach its insertion on the first metatarsal tuberosity. This anatomical relationship between the cuboid, peroneus longus muscle, and its insertion point enable important actions to occur, such as eversion of the foot, stabilization of the first metatarsal during propulsion (Toe-off) and plantar flexion of the foot and ankle joint. As you can see, the anatomical position of the cuboid and its relation to the Peroneus Longus muscle directly contributes to the biomechanics of walking and running. Athletes, such as runners, tend to overuse this pulley-like system, which overtime may cause the cuboid to slip out of its joint. When the cuboid shifts out of its position (Subluxation), it causes scattered pain and affects all of the surrounding bones, muscles and tissues. It is clear that a cuboid subluxation is an important injury to take care of as fast as possible, but the symptoms of the condition replicate many other injuries, such as the common inversion ankle sprain. Therefore, we want to discuss some common symptoms, diagnostic signs, treatments and prevention tips in order to help you diagnose and recover as fast as possible. 1) Symptoms – The most common symptom is an aching pain scattered along the lateral (outer) edge and plantar (bottom) aspect of your foot, which typically gets worse with exercise. Also, pain is usually accompanied by inflammation, swelling and weakness around the area of the cuboid bone. 2) Diagnostic Signs – As mentioned earlier, proper diagnosis of a cuboid subluxation is difficult because it shares the same symptoms as many other injuries and is difficult to see with an X-ray or MRI. However, As an expert in foot and ankle conditions, I am trained to make an accurate differential diagnosis in order to rule out other conditions and properly identify the underlying problem in order to treat your injury. In some cases, the cuboid can be visually seen to be displaced from its normal position when there is either a dorsal sulcus (from a plantar subluxation) or a palpable bump on the dorsum of the foot (from a dorsal subluxation). 3) Treatments – Here is the GOOD NEWS. If you are suffering from a cuboid subluxation then you could be relieved of pain within minutes after proper physical manipulation. Physical manipulation techniques allows realignment of the cuboid bone back to its original location while avoiding any further damage to the surrounding structures. After relocating the bone, we recommend strapping and/or padding around the area of the cuboid in order to maintain its correct position and stabilize the surrounding joints. 4) Prevention – The first precautionary measure to prevent a cuboid subluxation is to wear proper footwear, such as trail running shoes when running on uneven and rocky terrain. You should also avoid improper landings on uneven surfaces or stepping on hazards, such as stones because they can displace the cuboid. By wearing supportive shoes while practicing proper running form and landing can greatly reduce your risk of injury. Also, for any activity or exercise, always remember to stretch properly in order to alleviate the tension on your muscles that insert onto the bones of the foot. Unfortunately, there is no guaranteed method to avoid a cuboid subluxation. However, proper realignment of the cuboid through non-invasive manipulation techniques can have you back on your feet and running in no time!